The classic advice for public speaking nerves is to picture the crowd in their underwear. I wonder if the person who invented that ever tried it. I find it immediately increases the tension of a speaking situation. It makes you more aware of what’s at stake—the possibility of embarrassment, for the audience too. What does work is to picture the room around you as it was at 4 am. Empty and silent. Nobody there to need any particular thing to happen, or not happen. This simple thought makes it clear that the room itself is harmless, and so is speaking into it. Filling it with people changes that sense a little, but not so much that it feels dangerous. The mental image of an inert room shrinks the prospect of speaking from a frantic story in your mind down to its bare bones again—people in a room, one of them talking. It becomes obvious that however the talk goes, life will continue afterward. The room will be quiet again, with no trace of your forgotten lines or botched intro, if they even happened. Even if you never speak to a roomful of people, this ability to shift your view of a particular scene in this way is quite useful. 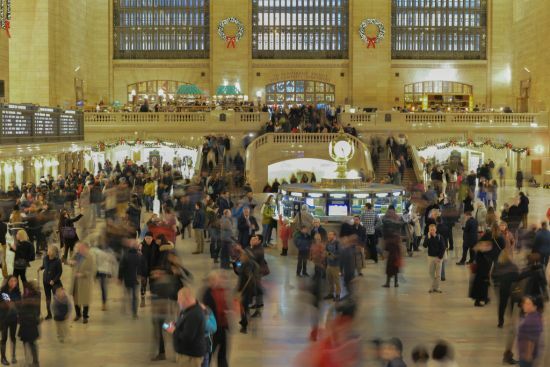 You can reduce the stressful effect of queues, crowds, busy subway platforms and family gatherings just by imagining that same space as it might feel with no people in it—either the previous night at 4am, or a century from now, when it’s a dusty ruin. Back in the present, suddenly the place isn’t so threatening or intolerable. It’s just what it is to the senses alone—a space with people in it—and the mind is only adding commentary. This remarkable little exercise works because our feelings towards the moment we’re in typically have little to do with the scene itself. Instead, we’re wrapped up in our own internal narrative around it. You round the corner to see a queue in the food court, and the mind immediately begins calculating what it means for your own interests: your schedule, your caloric intake today, your chances of getting a table. Your feelings respond to all of this commentary. The sight of the office floor immediately summons to mind your responsibilities to your boss, your rung on the ladder, how close it currently is to Friday at four-thirty, and all the existential weight of your story as an almost-middle-aged project manager unsure of how well he’s really doing at all this. All this symbolism obscures what is actually being experienced: fluorescent lights, the hum of copiers, idle chatter, the grey patterned carpeting, people looking at electronic screens. The bare facts of the moment—what life actually looks and sounds like right now—are drowned out and missed. And this tendency is painful, because it means we always have our emotional well-being tied off to dozens of moving parts, and we control so few of them. Anything topples the wrong way, or threatens to, and it hurts the heart. That’s why it is hugely liberating to imagine that “stressful” room as it might have looked in the dead of night with nobody around. Seeing that version of the same moment creates relief, because the scene is now stripped of your story, and our stress is tied to the story, not the scene. This reflection is best done in a public place, like a park, a square, or an airport terminal. Anywhere you can see the human world carrying on. When you can view the world, even for a moment, as it will be when you have no story left to fret over, nothing left to control, you discover something interesting: aside from the story in your head, life is okay as it is. Don’t be alarmed, but when you die, the world will continue on just fine without you. A few people will be sad—some of the tiny proportion of people who were aware you were even alive—but beyond that the ripples will disappear into the pond pretty quickly. So if that’s the only certainty in life, maybe we don’t need to be so uptight about having everything just so in the mean time. Just sit there, and really look at it go. The people, the wind, the clouds, carrying on forever. With or without you. After just a minute or two of this kind of uninvolved observation, it becomes clear that your story was never an essential part of the whole world. It was merely incidental, even if it was pretty interesting. It’s not that it doesn’t matter at all, but it’s not the only thing that matters, as it so often seems to be. As you watch the world carry on around you, it’s quite easy to imagine you’re not really there because, as you’ll notice, nobody is paying attention to you anyway. There’s so much human energy being expended out there, and so little of it has anything to do with your seemingly all-important story. You’ll get a healthy sense of the spectacular indifference the world has towards your personal needs. Oddly, this is a great relief. In life, you’ll do your best, or maybe just do your best to do your best, and in any case it’s fundamentally okay. The world can, and eventually will, exist entirely without your story—without you there to ache for things to always be falling your way. This exercise is humbling in all the right ways. It can even be a bit embarrassing, to realize that you may have, for decades now, never looked at the world as anything other than “the place where my life happens”. You don’t need to pretend you’ve died in order to let a moment unfold just as it is. But it helps you get used to what that kind of freedom might be like. Then when you go back to being in the world normally, it might feel more exhilarating than difficult, and more interesting than alarming. It won’t feel so important to control every little corner of it. You can let it be what it is, a lot of the time, while gently trying to make things go your way without ever quite needing them to. In every moment you experience without that neediness, you are free. Unless you are a buddhist monk, the only way you will overcome your fear of something is by exposing yourself to it over and over until it becomes engrained in your subconscious that it is not dangerous. There’s nothing you can do to in your thinking patterns that will make you feel better without lots and lots of exposure/training ahead of time. It was terrifying, for sure, that first class. The second one a little less so, but by the tenth I had my training wheels off. After that doing a presentation in front of a room filled with people that are actually sitting down and listening is a walk in the park. Luckily mindfulness isn’t something only monks can make use of. “Exposure therapy” is an effective brute-force way of managing fear without any kind of reflection, but it’s not the only thing we can do. Great article, David. I really needed to hear this today. I think part of the problem stems from a desire to stand out for just a millisecond in that ongoing, unfeeling world you describe. But once it’s happened and you’ve reaped the (meagre) benefits of this one-time special treatment? All that’s left over is the desire to do it again and the frustration when you can’t. It really is an addiction. The internal narrative around our experience is riddled with grasping and addiction. It is the mind framing the experience in the abstract, mapping it onto the future and assessing its value. So it is constantly identifying things that need to be locked down, protected from, criticized, etc, which generates those continual feelings of neediness. The exercise here is just a practice to notice for a few seconds what it might be like to experience the world without needing anything from it. > This remarkable little exercise works because our feelings towards the moment we’re in typically have little to do with the scene itself. Instead, we’re wrapped up in our own internal narrative around it. Thanks! This is great point. Personally, I often lost myself in such narrative and forget about how we can change world by changing our mental modelling about it. Will definitely practice this during everyday commute. It’s a good practice for keeping you in touch with that rare experience of “seeing without evaluating”. If you want to develop that skill further, look into meditation, because that’s what it’s all about. Stoicism and mind hacks are the best. Love your writings and courses. Thank you, David. I’ve been enjoying your posts for years. Always to the point valuable insights. Lately hearing many comments about the ‘echo chamber effect’ refering to the tendency to be self reinforcing in our thoughts and beliefs, mainly in conjunction with social media and news outlets. But isn’t human culture in it’s entirety one big echo chamber? 99.9 percent at least, with countless quantum tides of beliefs ebbing and flowing through collective consciousness. Your simple exercise of imagining the world without your personal presence offers an opportunity to cut through at least some of that. Yeah, the problem with the echo chamber is that it operates unconsciously. Without knowing what we’re doing we seek out reinforcement of our ideas simply because it feels good. This practice of noticing a moment without attachment helps us to see our thoughts for what they are, and that can allow us not to grasp at approval or reinforcement just because they’re available. Thank you, David. This is great. I used to get anxious over public speaking and my face would turn red. I chose a career where I mainly gave presentations in all sorts of settings. I didn’t realize what a concern I had for looking good, which clearly fueled my problem. Over time I focused more on my message and less on myself, and now when I feel the “heat” when all focus is on me, it’s almost comical. “Oh, there I go again”. This post was also a great reminder for me to let things be. I had the gift of seeing my mother grow from a highly opinionated woman, to a softer, gentler soul as she grew old. As a Hospice volunteer I’ve been honored to spend precious time with the dying. What peace there is in letting things be. The presence and connection of the dying taught me much about how to live. Thank you for sharing. I love your thoughts. It does make us uncomfortable, but reflecting on dying sure brings a ton of perspective to living. I imagine that kind of reflection would be unavoidable as a hospice volunteer. For me, engaging in mindfulness and meditation became another standard by which I measure myself. I’ve been reading Raptitude for a while and have participated in Camp Calm and in theory it all makes sense, but in practice I find myself with no respite from the endless stream of self-criticism. In fact, I now not only criticise myself in the usual ways, but also about my self-criticism itself. Have you had to deal with this or something similar? Any advice? Thank you! My thoughts, just start doing. Start the process of getting the things done that you are aiming for. Whether it’s increased health, a business or making new friends. Once you start taking action allow yourself to feel good and confident, because you now know you’ll eventually reach your goal as long as you keep at it. Even if it takes 3 months, a year or 5 years. You’ll get there. This attitude has helped me. Thank you, Arthur. You make an interesting point. I’ve found that just moving, taking the first step without thinking, usually works. However I’d still like to learn to be less reactive through meditation and mindfulness without it becoming another goal at which I’m failing. If I realize I’ve been moving by the “Good — more of this please”/“Bad – avoid”/“Who cares—this does nothing for me,” I feel like a failure for not doing things correctly. It’s really hard for me to get out of this mindset. Becoming less reactive through meditation might just take time. I remember when I first started dabbling with meditation, for the first three months nothing really happened. You might just be too hard on yourself…a lot of us are. Even the ultra successful. My opinion, just keep trying to give yourself less and less negative self talk…hopefully it becomes natural eventually (Another idea: maybe your standards are too high for the short-term). Some self-criticism is probably inevitable whenever we do something new. In my experience it shrinks drastically after a while with meditation, but I do remember it being a major hindrance in the beginning. Mindfulness itself will eventually undermine the self-criticism out of its very nature — one way of defining mindfulness is “awareness without criticism”. A major hump in the beginning is getting over the idea that we’re trying to have a particular experience in meditation. Mindfulness is about letting ourselves have the experience that is already there, already available in the present. Yet we come to it with expectations to change something, to become more calm, for example. But we need to practice setting aside any particular goals while we do the practice itself. The point of mindfulness meditation is to allow yourself to receive the experience that’s already happening, that’s it. And if critical thoughts come up, critical thoughts come up. If we get lost in them, then we come back. Nothing in particular needs to happen. A helpful refrain is “It’s okay”. Whatever you notice, it’s okay. If you notice the mind is being flighty, it’s okay. If you notice the mind is being critical, it’s okay. A big part of mindfulness practice is discovering how snippy and critical our thoughts often are, and letting ourselves be human in that way. Those thoughts are okay. This noticing and allowing is what mindfulness is all about. But that receptive attitude isn’t something we’re used to, so reconditioning it takes time. In Camp Calm I try to emphasize being gentle with ourselves when it comes to mindfulness. That gentleness helps avoid that feedback loop of self-criticism. To me, the problem is too much thinking. Thinking about lines, walking, lights, audience, what they’re thinking, what they’re talking about etc..more thinking would probably exacerbate the problem for me. Action is what is needed to shut off the thinking mind. Jogging in place, jumping jacks, high five your team, talk to your team. Get your mind off thinking of the stage, and the fear will probably go away. Action also gets you into flow. Yes, I agree, and I think part of the reason we get so easily lost in our narratives is because people’s lives aren’t as physically demanding as they once were. Try ruminating while you’re chopping firewood, or plowing a field. The thoughts never get a chance to snowball because the attention is required by the body. Sorry about that. Thinking in existential terms has unpredictable effects. But I think that means we don’t do it enough. No worries. I think you’re right, maybe if I do it more it’ll be easier to digest for my brain. Great piece as always. Thank you for the post. The thought of the exercise even defuses the thoughts of stressful situations. The one thing that I grapple with- and I know this sounds too aggro- is the tendency to let things happen and be instead of making things happen and creating a more comfortable, preferable reality out of a disagreeable situation. There is something rewarding to being an active participant as opposed to a passive one. Sure, ego is a significant part of that. I guess it come down to the struggle of wanting more and the stress that goes along with that struggle or being complacent, accepting what is, and the surrender of one’s ego through that process. Maybe it’s a matter of how one picks and chooses what to endeavor toward and what to simply accept. I think we all have that desire, to participate in the things that affect us, and try to make a better situation out of it. But we have trouble with two parts of that: 1) We insist that we must have a certain outcome (when the nature of life is that we must regularly accept undesirable outcomes), and 2) We yearn for control over things we can’t control. You could even argue that there are no outcomes we control completely — even when we can affect things, there are always other factors involved. I love this! What a great way to reframe events. Going to give it a try. I like the feeling of walking around a dark empty church at midnight. Especially around Christmas when it’s all decorated up with garland and wreaths. I like to look at the sheet music propped open on the pipe organ, still turned to whatever page they finished with. I love these kinds of details. Things left behind. I was this most struck when Ariel Sharon the former Israeli prime minister died in 2014. He had just ordered Israeli troops out of the Gaza strip and the news was intensely focused on him, the changes he was orchestrating and the opportunities for peace. Then he had a stroke. The world moved on. It makes a mockery of most politicians or entrepreneurs concerned with their legacy. Even large ripples will fade over time. Will anyone remember JFK in 500 years time? I suspect the drive to be remembered results from a fear of death and the difficulty of accepting it. You touched on this in the comments David. Everyone from Buddha to Sartre has believed that the constant consciousness of death exposes the emptiness of convention and break the crust of routine. Only this is the guarantor of intense life. Thanks again, David. Another wonderful piece. I wonder – what if one already feels as though their story has largely passed away? For me this doesn’t bring a lot of comfort into my experience. Maybe it is that I’m living a story that I’m someone who has little in the way of a coherent life narrative. Sometimes. Of course it tends to be easier when I let that one go, too. Great post. It is very helpful to have some kind of framework to visualize the world in this manner, instead of just seeing it and immediately thinking about how it applies toward what you do or do not want. Better to consider how the world operates with very little thought toward you (neuro-scientists describe something similar called the “spotlight effect” in which you might think all of your actions are on broad display, when in fact few people are even noticing or caring about you). Plus as you say here, the entire experience is both humbling and freeing, in that you realize how able you are to be yourself and express yourself. Thanks for being so great at breaking down the importance of these issues, in ways that we can use and think about in our everyday lives. When and why did underwear get tacked onto that time proven old trick? Spend a few days naked among naked people. Both problems stay with the clothing. First is the ability to simply allow ones self to visualize a naked crowd. Second for any residual self esteem issues not vanquished with the first. 99.9% of such paranoia is uploaded societal filtration bloatware designed to disarm potential consumer victims. Believe it or not.